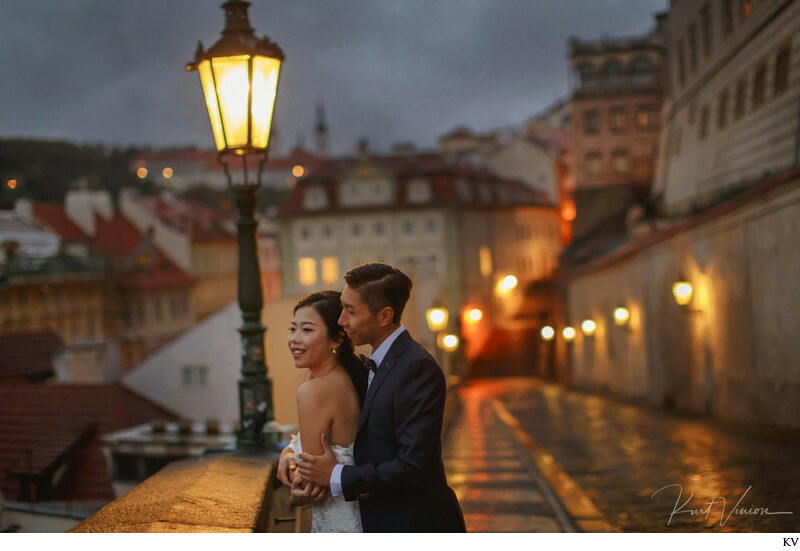 Our latest couple Rebecca and Frank hail from Shanghai, decided to have a photo session in Prague after traveling around Europe. Unbeknownst to Rebecca, Frank also had a surprise engagement ring – and what followed was a wedding proposal that was live streamed to the world. Rebecca & Frank also had a bit of a dilemma, they waited to nearly the last minute (they are very busy & successful people) and not only did they wish to have a European pre wedding but they also needed to have the entire session edited, retouched and files sent within two weeks. Of course when money is not an issue anything is possible. The other issue, Frank wanted to share his surprise marriage proposal to friends and family from around the world. What follows is a wonderful autumn morning (minus the sun…sometimes we have bad luck with the weather here), two outfits (that red dress is amazing) and a surprise that caught Rebecca totally off guard. Location: Prague Castle, Czech Republic.